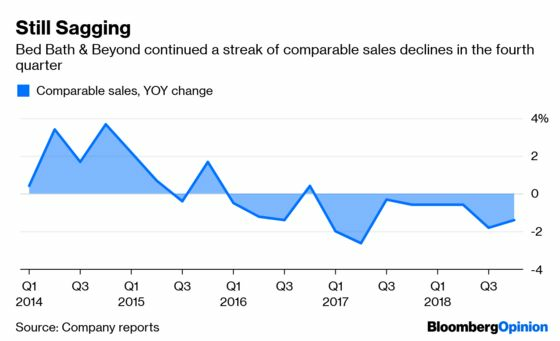 (Bloomberg Opinion) -- If Bed Bath & Beyond Inc. hopes to keep shareholders from supporting an activist investor campaign to toss its entire board, its fourth-quarter earnings and outlook didn’t do enough to help its cause. Bed Bath & Beyond has rebuffed the activists’ overtures by saying it “is making significant progress” on its transformation plan, and in fact, its earnings guidance for 2019 was better than analysts expected. I’m not sure it should be particularly soothing to investors, though. The company said it expects operating profit to “stabilize” and earnings per share to “grow slightly.” It sees net revenue falling to between $11.4 billion and $11.7 billion amid continued store traffic declines. That doesn’t sound like “significant” progress to me. Bed Bath & Beyond threw a bit of chum to investors Wednesday who were looking for a response to the activists, whose demands include ousting CEO Steve Temares, a leader they say is excessively compensated. It said it is accelerating its program meant to bring new faces onto its board of directors, and said additional changes are coming soon to its governance structure and compensation practices. But these are relatively small changes for a company that needs a major overhaul. 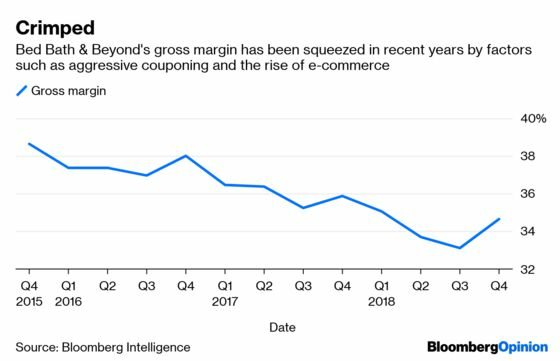 And they don’t change the fact that, in general, Bed Bath & Beyond has yet to present a compelling case to investors that it has the right solutions to its problems – much less a speedy enough approach to implementing them. Take, for example, its plan to expand the number of stores that carry furniture. The retailer has talked for years about this category being a major revenue opportunity and a way to establish itself as a winning destination for all things home-related; executives have said they expect to go from 70 stores with this offering to 150 in 2019. But that’s not much, considering the company has almost 1,000 Bed Bath & Beyond locations. Are investors honestly supposed to be impressed that this offering is going to be rolled out to a puny 15 percent of stores? And then there’s its plans for “next-generation stores,” a select group of locations that are piloting new approaches to merchandising, use of space, or labor allocation. I’m very much in favor of Bed Bath & Beyond rethinking its current look, which I might currently describe as floor-to-ceiling clutter. However, the next-generation initiative lacks clarity. It includes some smart ideas, such as reduced inventory and more inspiring displays. But it is also includes headscratchers like tinkering with its health, beauty and food offerings. For a company that professes to want to win at things like wedding and baby registries, and that claims to be focused on profitability, why expend effort on these low-margin items that are outside its core business? Bed Bath & Beyond could help itself by offering more details, such as a specific timeline for rolling out new store designs across the entire portfolio or a closer look at its plans for BuyBuy Baby, a chain that has loads of potential in the post-Babies R Us era. Or it could go bolder, such as by exploring a sale of some of its smaller (and potentially distracting) chains. It didn’t do any of those things in its earnings announcement. And I suspect that leaves plenty of room for the activist group, which includes Legion Partners, Macellum Advisors and Ancora Advisors, to keep making the case for a clean sweep.